40+ Style » How to wear color » Black and white outfits – Discover how to best wear this popular color combination in 60+ outfits! Black and white outfits – Discover how to best wear this popular color combination in 60+ outfits! We appreciate black and white pairings because of their inherent minimalism. Even when heavily accessorized or embellished, the look still retains an inherent minimalism that transcends style personalities. A few tweaks can take the look from rocker chic to romantic elegance. Below I will showcase black and white outfits from myself and other women. 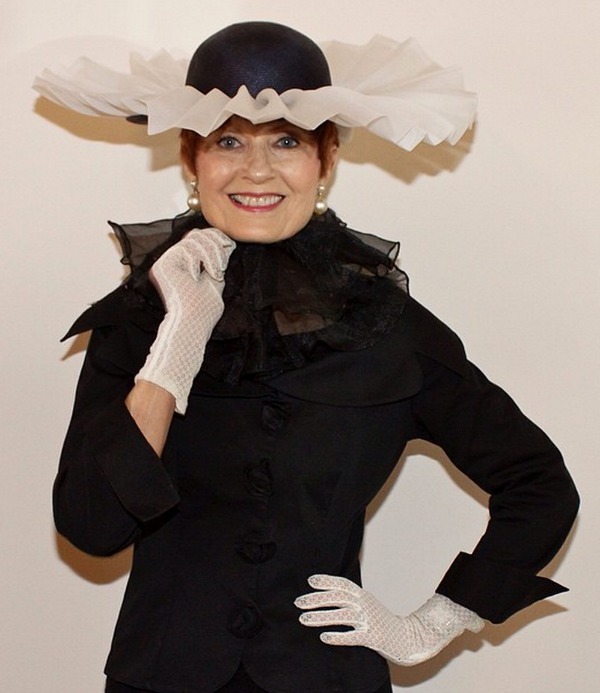 I have selected those black and white outfits that are timeless and still look hip today now that we are in 2019! This is the classic combination but that doesn’t mean it has to be boring! Pairing your black base with an asymmetrical white top is both chic and hip! Please note, these tops are no longer available but I’m loving this white asymmetrical top. It looks extra nice when you combine this simple outfit with pumps but simple ballerinas or arty flats would work fine too. The hat makes the outfit a little bit dandy, the pumps makes it feminine and create the perfect balance. If white close to your face is not your best color, a great trick is to add a statement necklace. Red always looks really good on me and it gives this outfit the pop of color it needs! The below necklace works well too as do the colorful glasses. 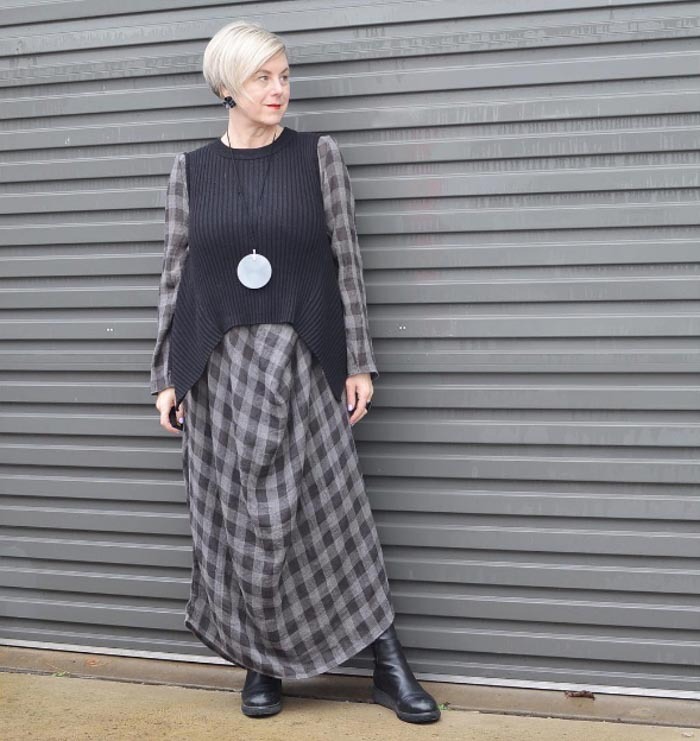 Plaid and layering were two key trends on the fall catwalks, and this look features both, along with a statement pendant necklace. 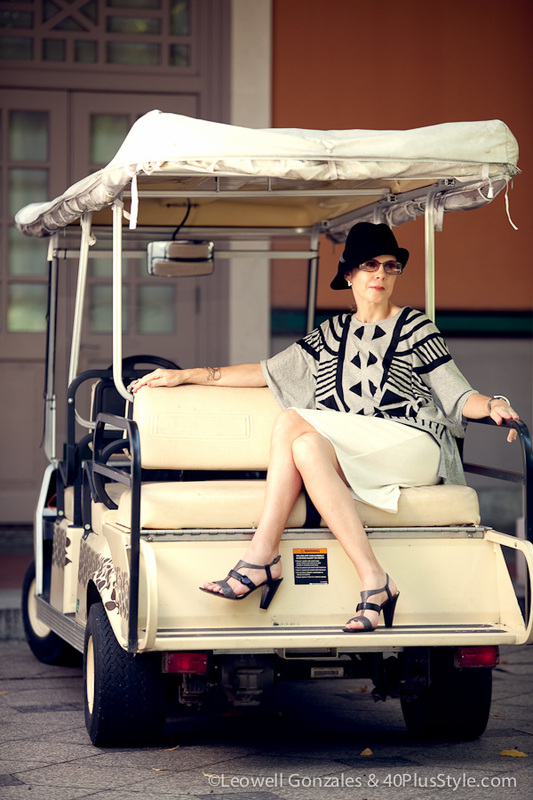 If you’d like to read more about Deborah and her style, you may read her style interview here. 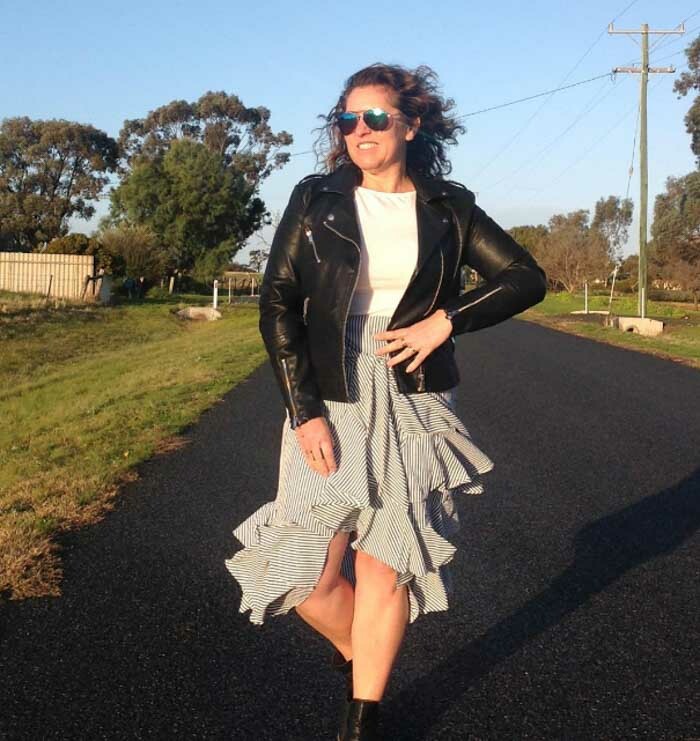 A fabulous transitional piece, a classic black leather moto jacket can take summer outfits through to fall. Here, black booties and a pair of aviators provide the perfect finishing touches! A monochrome topper is worn over a black dress to create a stylish black and white outfit. Chunky rings add extra interest and are one of 40+ stylish Ruth Essex’s tips for instantly adding style to any outfit. 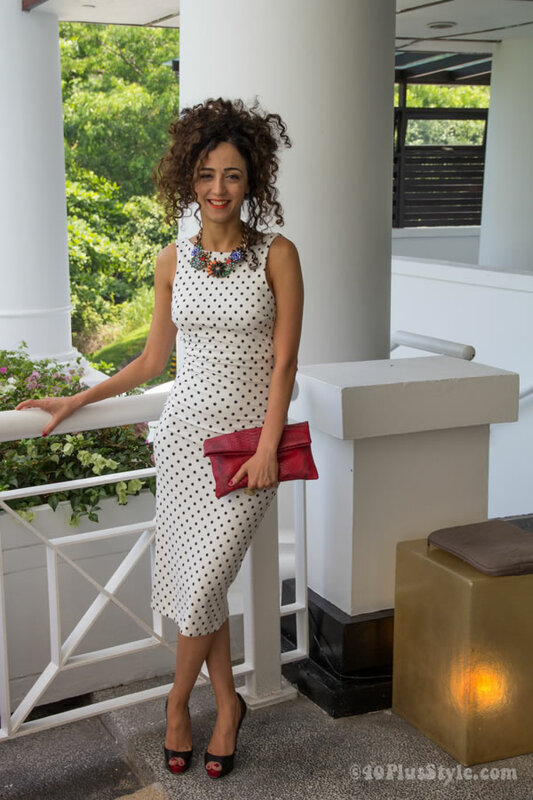 Get Diana’s tips on how to make a statement with her style interview here. Black and white lends itself perfectly for print mixing. Stripes, dots and patterns can easily be mixed together. Also note, that I tried this outfit with both my red hat that you have seen before and my new black hat that looks a bit like a hat from the twenties. The red hat is a little bit more photogenic while the black is a bit more chic. Adding the second graphic top, makes for some nice pattern mixing, a trend I have admired in others and was keen to try out myself. The top is also very versatile and you can really have fun with it for photographs! In the end I decided to go with the black hat, as I felt that the outfit itself was playful enough. Of course, I kept the red shoes and watch. A dress is always a good idea and a black and white printed dress is great at camouflaging your belly too. 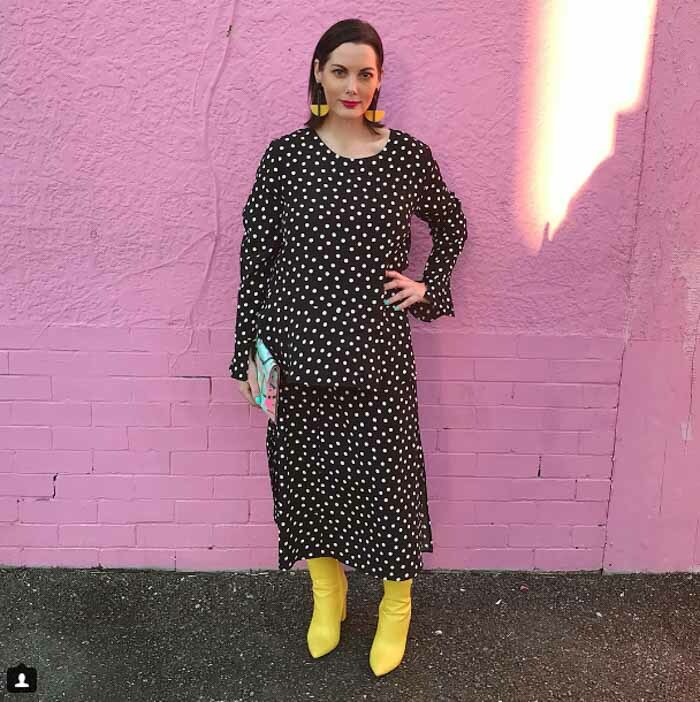 Polka dots are a perennial style staple which are always on-trend, but they’ve definitely been having a moment this year. Here, they are teamed with bright boots and matching earrings. There’s more polka dot inspiration here. A modern, yet comfortable look! If you want to look a bit edgier then black has always been the color of choice. A leather jacket adds a bit of fierceness to your look. Minimalism was taken to a new standard in this look. A peplum cut leather jacket layered effortlessly on a sheer white dress. We love the contrasting green clutch that brings some evening elegance into the day, but is cheerfully appropriate when contrasted with the black and white pairing. I love the funky & edgy look of this woman who truly makes a statement with this (almost) all black outfit! If you want to embelish your black and white outfit and add a bit more pizazz then you can add a bit of glamour with sequins as in the photo below. Expert tailored pieces that fit and flatter well take looks to the next level. We love how seamlessly the ankle boots integrate with this ensemble. Here is Linda fargo in a beautiful black and white outfit.She has chosen to stay warm in the cold New York winter in what looks like a fur coat and hat. But then, who knows, it may be fake fur too. Although I like her look, I would personally choose not to wear fur. I would not even wear fake fur when that looks too much like real fur. Loving this black and white cape worn over a straight skirt. This look showcases how to perfectly wear thigh high boots without looking like you stepped off of the set of Pretty Woman (pre-makeover). The unique cut of the white coat with the contrasting black fringe coordinates perfectly with thigh high suede boots. Truly, the look is composed of two key pieces (the coat and thigh high boots), which when paired together make it look more complex. A modern coat meets a rustic (Laura Ingalls Wilder-esque) utilitarian dress to create a very chic sartorial contrast. We love the black accents on the coat and the black peek of her gloves and bag. The monochromatic bottom with the lighter top makes her look even leaner. We love how she has three layers, but her play with mixed lengths certainly does not make it look bulky at all. The all-black bottom puts the stripes and textures of her tops on display and shows of the fabulous styling. Loving the long vest here, which is still very much on trend. Black and white for a wedding! Do you agree these outfits are ageless? Also, do you ever tire of black & white? What a great tee. I like the asymmetrical cut. And the skinniest are a perfect pairing. Just chic. This is now my favorite outfit of you . I absolutely love it. It´s simple but divine!! It’s one of my favorite outfits too. But then again my last outfit usually is…. You look super chic with a twist. I love black and white! It’s my best combo… ever! Yes and it’s that twist, that makes it interesting for me. Thanks Nina for your kind feedback! Perfect outfit for so many occasions. 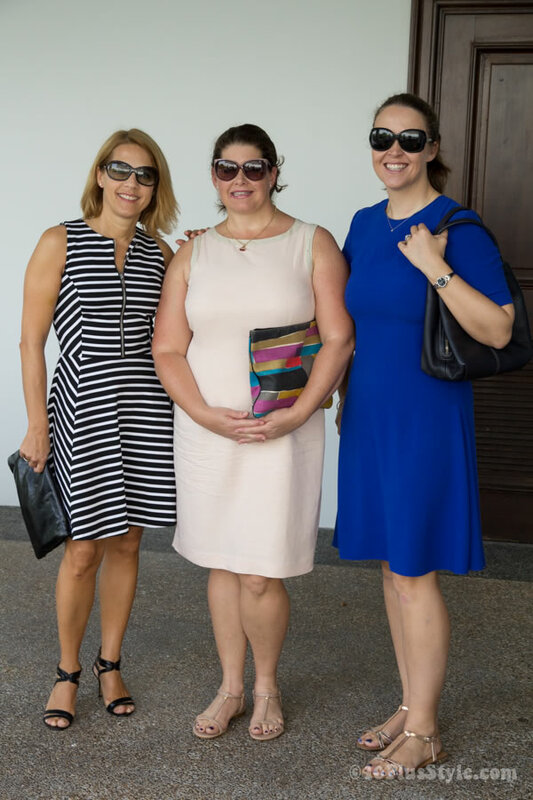 Simple and chic, a great travel outfit. The hat and the bracelet accessories strike just the right note. I’m going to look for a nice asymmetrical top and try my own version! Great look Sylvia! Each piece contributes to your portrayal of casual elegance. Sylvia, I love this. Today I saw a woman wearing a simple black/white combo and I thought, wow, she looks stunning. And then here you are! You prove that you don’t need to get complicated with clothing to look fantastic. I really like this outfit. How could I not? Being a lover of black and white. And I see your point of not adding a necklace because of the hat and sunnies. You are right although I would have had to sit on my hands. As I love necklaces too. I like the simplicity of this outfit and the shape and layers of this beautiful top. A black top underneath is a great idea, especially for The Netherlands where you usually need an extra layer. It creates a lovely elongating column of color underneath. For Singapore, you want to keep it as cool as possible so it is best to wear an invisible bra.